YOUR ROTARY CLUB NEEDS YOU! The Rotary Club of Chester-le-Street was founded in 1927. It is part of a world-wide organisation of business and professional people comprising self-employed business owners, teachers, bankers, executives and community leaders; to name but a few. We are pledged to serve our communities, locally, nationally and internationally. We promote the highest ethical standards in all areas of working life and work for peace and goodwill worldwide. You are invited to become a member of the Rotary Club of Chester-le-Street and help us in these activities. We need members, men and women aged 21 or over, who are ambitious and motivated, have a good sense of humour, like to have fun, and want to join us in some some of our exciting charitable projects; and also enjoy our social events. We meet locally and comprise of 20 members, men & women, some of whom are active in business, education, leaders in the local community, or retired from their profession or vocation. We believe that commerce and community are inter-dependant and, through the membership of Rotary Clubs world-wide, we work to serve our communities. We enjoy good fellowship and fun, and together work on local and international charitable projects. I look forward to seeing you at one of our regular meetings. We welcome new members. So ...... if you are interested in joining us do get in touch with us please. The entry age to Rotary is 21 years of age and open to business and professional people, local community leaders and executives (visit our 'Members' page to see people who are enjoying life as members of Rotary). Because our membership covers a wide range of ages from many different occupations, the resulting fellowship is always interesting and lively. Our aim as a Rotary Club, is to help others while enjoying ourselves in the process. 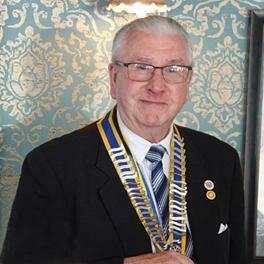 Rotary is a truly international organisation, over 100 years old. Today 1.2 million Rotarians belong to some 31,000 Rotary Clubs in 166 countries. We meet many of these members when they join our meetings or when we, as group or individually, visit other Rotary Clubs, or Rotary Conferences abroad. From this interaction we get a real feeling of community which helps promote one of Rotary's main objectives - international understanding. Gaining understanding of, and having an impact on, international humanitarian issues. Overseas Projects by Young People. Hermann Gmeiner Sheikh Secondary School, Somaliland. Tools for Self Reliance in under developed countries. SOS Charity (African schools, villages). Rotary Youth Leadership Awards (RYLA). We are a Rotary Club that meets for lunch at the 'The Whitehills', Waldridge Road, Chester le Street, County Durham DH2 3AB, at 12.00 (noon) for 12.15 pm, each Friday. Lunch is usually followed by a Guest Speaker. President's Night - an annual event. Weekends away - London, Paris, Liverpool, Edinburgh, Harrogate, Leicester. Visits to other Rotary Clubs. International Friendship Exchanges to Rotary Clubs abroad. Annual Academic & Community Achievement Awards to local Students (The Rose Trophy & The Frank Baddiley Awards). Sponsorship - James Etherington Music Trust Awards for local young musicians. Annual Music Awards to local Musicians (The Elliot Davidson Music Award). Childrens' Charities, ie Bubble Foundation. Grace House Childrens' Hospice Appeal, Sunderland. Green issues - annual local collection & recycling of Christmas trees. Army Benevolent Fund - The Soldiers' Charity (Northeast). SANDS (stillbirth & neonatal death charity). Changing Lives (formerly The Cyrenians) - Helping the Vulnerable & Homeless. Lumley Ladies under 12s Football Team. SSAFA (Soldiers, Sailors, Air Force Association), Tyne & Wear. Royal British Legion Poppy Appeal - 'War's End Concert'.